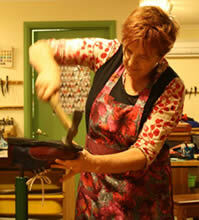 I originally trained over 30 years ago at Cordwainers College in East London. The course was a mixture of technical work alongside design with the view that in order to work in the industry as a pattern maker it was necessary to understand the processes involved in the trade. This was a great grounding for my journey in footwear which has involved manufacturing, designing and working as a self employed shoemaker for most of my working life. I have been involved with teaching shoemaking in adult education in a variety of community settings in the UK as well as making shoes. More recently, since moving to Tasmania 10 years ago I have been able to work full time with this work and involved more with custom work, primarily for people needing medical grade footwear and with special needs. Moving here and being able to build my dream workshop which is purpose built for teaching has enabled me to build up the teaching side of my work and I have always loved passing on skills and feel passionate about keeping this art form alive. I have felt very supported in my trade since being here and I continue to be amazed at the level of skills that people in this country bring to the groups I run. I have also been able to focus more on the creative side of shoemaking and this is reflected in experimentation with different materials as well as traditional leathers. My design work using printmaking, painting, felting, woodcarving and traditional and contemporary textile arts has given me the opportunity to create wearable art shoes that are challenging and exciting to produce, beautiful to work with and yet still functional.